Real Madrid host Barcelona in a must-win Clasico at the Bernabeu on Saturday, knowing only victory will keep their title hopes alive. 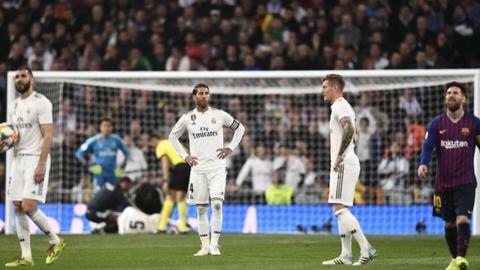 Los Blancos are nine points behind their bitter rivals, who handed out a 5-1 thrashing when the teams last met in La Liga in October. There has been more Clasico success for Barca since then, with the Catalan side staying on track for a fifth successive Copa del Rey by overcoming Real in the semi-finals, including a 3-0 second-leg victory at the Bernabeu on Wednesday. As Real seek revenge in the second meeting in four days, their hopes are being pinned on an exciting teenager who was their brightest spark in midweek and is now set for his first league Clasico: Vinicius Junior. Let's find out more about a player who this week earned his first call-up to the senior Brazil squad and why his spectacular performances have been surrounded by just one significant doubt. Right down to the 'Junior' appendage to his name, there are several striking similarities between Vinicius and another extravagantly skilful Brazilian forward, Neymar. Both were touted for superstardom at a very young age, with Neymar given his senior debut for Santos at 17 and continuing his rise before being snapped up by Barcelona - who beat Real in a frantic race for his signature - four years later. When Brazil's 'next big thing' grabbed the attention of Europe's elite in the form of Vinicius, Real acted decisively to ensure they didn't allow another superlative young talent to slip through their fingers. In May 2017, Vinicius was only 16 and had played just a handful of games for Flamengo - where he had progressed through the youth ranks - when Real committed to sign him. The deal could not be completed immediately, because Fifa rulings don't allow clubs to sign players from different continents until they are 18, so Vinicius remained in Brazil, with the two clubs initially agreeing he would stay on loan at Flamengo until the summer of 2019. However, the youngster's form in Brazilian football convinced Real to bring him over as soon as possible, so the original plan was abandoned and he swapped Rio de Janeiro for Madrid last July, just a week after his 18th birthday. The boy wonder's arrival prompted excitement among Real fans, who were eager to see why their club had forked out so much money (£38m) for such an inexperienced player. They didn't have to wait long to find out. Vinicius didn't immediately command a starring role at Real, as coach Julen Lopetegui decided to continue his development in the less pressured environment of the club's B team, who compete in Spain's third tier. However, that demotion was not judged favourably by many fans or media, especially when the teenager quickly produced a number of highlight reel moments while the senior side floundered under Lopetegui's fragile direction. The turning point came at the end of October. With Vinicius not even on the bench, Real were hammered 5-1 at the Camp Nou and Lopetegui was sacked. In a fortunate twist of fate for the Brazilian, the new man appointed was Santiago Solari, who had been coaching the B team - including Vinicius. One of Solari's first moves was to elevate his former charge into the senior squad. In the new coach's opening league game, at home to Real Valladolid, Vinicius was introduced from the bench with 20 minutes remaining and the game goalless. Ten minutes later he broke the deadlock, setting up a much-needed 2-0 win. In truth, that goal against Valladolid owed much to fortune - it was a badly misplaced shot which took a huge deflection to wrong-foot the visiting goalkeeper. But that didn't matter. Vinicius had made his mark, and he has never looked back. Wednesday's cup match against Barca was Vinicius' 14th start in the past 15 games, and his performance amply justified his new-found status. Even though Real lost, Vinicius was brilliant. He created countless moments of danger, regularly tormenting visiting right-back Nelson Semedo, and he will surely have left the field wondering how he failed to score despite six attempts on goal, four more than any other player. His chief attribute is magnificent dribbling. He has remarkable balance, blistering acceleration, a lightning change of direction and an ability to retain control of the ball even at full speed. But that's not all. He also plays with his head up, has great awareness and an unselfish attitude. And, perhaps most impressively, he appears to be completely unfazed by his lead role at such a huge club during such a tough season, taking everything in his stride and never shying away from responsibility. All those qualities create a thrilling performer capable of unlocking defences with devastating ease. This was best demonstrated by a wonderful assist for Karim Benzema in the recent Champions League trip to Ajax - Vinicius running on to a pass down the left, cutting inside at speed, gliding past three defenders and generously laying a perfect pass into the Frenchman's stride. Moments like that explain why Solari - whose job is by no means secure - is prepared to place so much trust in an 18-year-old, and the Real boss is hardly Vinicius' sole admirer. Before last weekend's game at Levante, opposing coach Paco Lopez gushed: "Vinicius is showing why Real Madrid bet on him. With his speed, he is capable of taking off and he plays with a lot of bravery." And his team-mate and compatriot Casemiro recently raved: "He has surprised everyone. Three months ago he was playing in the Segunda B, but now he's an important player for us. "He has an incredible level." Vinicius is still less than 50 starts into his senior career, but the consensus is clear: the sky is his limit. However, there is a caveat. One thing has been missing from Vinicius' otherwise dazzling performances - and it's the most important thing of them all: goals. The fact that he didn't score against Barca on Wednesday despite getting into several great positions was no surprise - because all the composure and precision he demonstrates in general play disappears when he's in front of goal. Vinicius squandered similarly good chances in last weekend's game at Levante, and his record of two league goals - one of which was a huge deflection - from 31 attempts in nearly 11 hours of football is, to be blunt, nowhere near good enough. That deficiency is perfectly understandable in such a young player, and there's every reason to believe he will become a regular scorer with more experience and confidence in front of goal. Former Real player and coach Jorge Valdano, now an esteemed pundit, believes the goals will start to come. Comparing Vinicius to a club legend, he told radio station Onda Cero: "When Raul was Vinicius' age, we had him practising his finishing every day. Goals come through training and Vinicius will improve. He just needs to stop and lift his head." Vinicius' age doesn't immunise him from criticism, however, and his wayward finishing was a major part of the post-match dissection following Wednesday's Clasico. Barcelona fans enjoyed themselves by creating mocking memes on social media, while newspaper AS summed up the disparity between Vinicius - six shots, no goals - and Luis Suarez - two shots, two goals - with its headline: "Vinicius plays, Suarez kills." Real's problem, of course, is that they don't have time to wait. To salvage their season, they need Vinicius to match his dazzling approach play with end product right now - starting against Barca this weekend. Solari, despite the presence of Gareth Bale, Lucas Vazquez, Marco Asensio and Isco as alternatives, appears to trust that Vinicius can deliver. With his team's season and perhaps his own job on the line, it's a massive call for the manager to make, but so far he has not wavered and it would be a big surprise if Vinicius does not start on Saturday. He will, no doubt, be hugely exciting to watch and create all sorts of problems. But the question is: will he score?